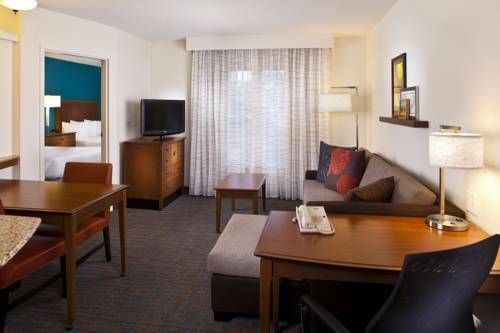 Feel right at home at Residence Inn Daytona Beach Speedway/Airport. Boasting a premier location, our hotel is less than a mile from Daytona International Speedway and Embry-Riddle Aeronautical University. Enjoy easy access to and from Daytona Beach International Airport with our free shuttle service. Unwind in our pet-friendly suites featuring luxury bedding, fully equipped kitchens, ergonomic workspaces, flat-panel TVs and free Wi-Fi. Fuel up at our complimentary breakfast buffet offering all of your morning favorites plus coffee. On select evenings, join us for The Residence Inn Mix to mingle with fellow travelers while savoring light fare and drinks. Our outdoor pool and 24-hour fitness center are ideal for getting a workout in while on the road. If you're in town for a professional meeting or social celebration, reserve our 600-square-foot event space to host a successful gathering. Let Residence Inn Daytona Beach Speedway/Airport exceed your expectations for short and longer stays.